2 cups Mexican style shredded cheese, Monterey Jack etc. Roast the peppers. Slit the chili peppers down the center, scrape out the seeds and arrange on a large foil lined baking sheet. Bake at 450F for about 10 minutes or until the pepper’s skins have blistered. Turn and bake for a few more minutes. Remove from the oven and using tongs, transfer to a heavy duty freezer bag or a bowl with a lid. Seal the hot peppers in the bag (or cover bowl) and let cool. When cool, remove from bags, peel away skins, chop. Bring 10 cups of water to a boil. Stir in the soup base. You can also add a little salt to the water if you want. Add pasta and boil until al dente (7 to 12 minutes depending on type). Meanwhile, in a food processor or blender, process the sour cream, and chopped chile peppers. 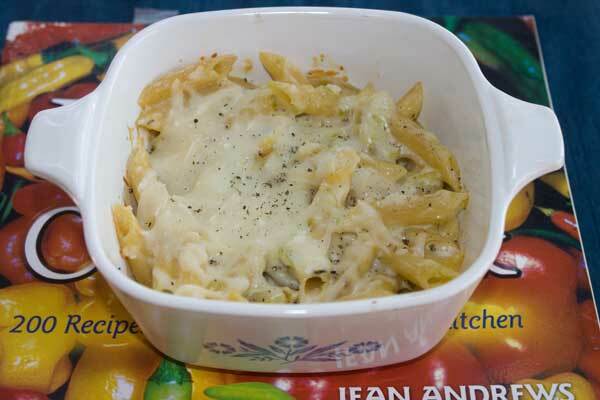 Drain the pasta and toss it with the sour cream mixture and 1 cup of the shredded cheese. If you feel like it, add a little cream. At this point you can add some salt and pepper to taste, but I never do. Arrange in a greased 9x13 inch casserole dish and cover with foil. Bake at 375 F. for about 10 minutes, then sprinkle remaining cheese over the top. Bake uncovered for another 10-15 minutes or until cheese is melted. To halve the recipe, halve all ingredients and bake in an 8 inch square casserole dish (1 to 1 1/2 quarts). The amount of hatch peppers is a suggestion. Use however many you want! Also, the soup base just adds a touch of flavor to the pasta. You can skip it if need be, but if you skip it make sure to salt the water.